Well, it’s time. Well, it’s time. We’ve had the first list of great Nintendo fan games. We’ve had the second list of great Nintendo fan games. But we’re not done just yet! Oh no, here’s another list of amazing fan projects! Yes, they’re not as well known as Mother 4 or Mushroom Kingdom Fusion. None the less, they’re all still incredibly well made titles, and really do show you just how far the fan game and ROM hack development scenes have really come in the last decade or so. Namely, Newer Super Mario Bros. You remember the Wii games, don’t you? The games that introduced new enemies, new music, new bosses and all kinds of fun, interesting new levels and mechanics to the New Super Mario Bros series. The ones that got this right nice trailer? Well, the series is continuing. And now it’s on the DS! Yes, Newer Super Mario Bros DS is now a thing, and it looks great. Made by modder Skawo, the project tries to loosely port the Wii game over to the DS, with some of the features, graphics, music and ideas from the main game coming with it. As you can see, it pulls of the feel of the older games really well, and the new level concepts work really well on the DS too. Like that awesome space level, which seems to have reduced gravity befitting the theme. With that nicely downsampled Mario Galaxy music and the gorgeous graphics, it really makes me wish Nintendo considered making more space themed levels for their own 2D Mario games. I mean, why should the 3D games get all the fun stuff? To another Mario hack. Yeah, I know it’s a bit much to have two in a row. But come on, it’s a port of Super Mario Sunshine to the DS. How can you not think that’s one of the coolest concepts ever? But while the idea is neat, it’s the execution that matters here. Porting levels is cool, but it’s also a fairly common thing in the modding scene now. Heck, the Mario 64 scene (at least on home consoles) seems to have made a hobby out of trying to port whole worlds from as many games as possible. It’s a really neat project, and though only a remake, shows just how much the original DS could have been capable of had Nintendo felt like making a few more big 3D games for it. Seriously, it’s a real shame how wasted the DS’ capabilities in regards to running 3D games were. I mean, there was Super Mario 64 DS, Mario Kart DS, Metroid Prime Hunters… and I think Diddy Kong Racing DS? Nintendo basically treated the whole thing like a big GBA, with about ten times more 2D titles for the system than 3D ones. Mario Sunshine 64 DS shows that more could have been done there. And also, that maybe a proper 3D version of Zelda Phantom Hourglass could have been a possibility too. Well, the ‘current’ version of the game anyway. It’s been attempted by about twenty different teams at this point, and the results have usually been something akin to ‘gave up after realising the effort required’. Or pretended to die in a car crash if your name was Dampe. None the less, the current version of the game looks quite a bit more promising. For one thing, they’ve actually got some progress to show up to Hyrule Castle in the released demo, so that’s a bit further than most people got. And hey, with stuff like Dodongo’s Cavern and Jabu Jabu’s Belly in active development, it seems like we may actually get a finished game this time around. And hey, an online mode seems to be present here, which is something cool. Can’t wait to see that get remotely active! So yeah, let’s hope this version gets a bit further than the last few attempts. As well as you know, onto the next item on the list. Yeah, I know. This is a bit of a cop out. Why not just list one Paper Mario fan game? Because to be perfectly honest, there are multiple incredible looking projects out there for this. Worry not Thousand Year Door door fans, your prayers sequel have now both been answered. It’s basically Super Paper Mario esque exploration mixed with Thousand Year Door’s amazing battle system, which is a combination that looks a whole lot more appealing that ‘lets fight with cards and stickers’. The really nice Gamecube esque graphics and tons of original characters help too. There’s also Paper Mario Colours of Creation, if you prefer a wholesale Super Paper Mario successor complete with more action orientated feel to it. Again, it features a ton of original characters, interesting gimmicks and partner mechanics and heck, even integrates the audience into the gameplay more than its inspiration ever did. There are others too, though a couple were mentioned in previous articles. Also of interest are various attempts at hacking the original Paper Mario thanks to an editor called ‘Star Rod’ and the Mario RPG Universe topic about a hypothetical new game called ‘Paper Mario Wonder Journey’. It’s pretty clear the fans are doing what Nintendo isn’t here, and they’re doing it much better too. Which is one that’s been posted here on Gaming Reinvented before. Either way, Donkey Kong Country 4 is exactly what it says on the tin. A full blown sequel to the original SNES trilogy with the same art style, all playable characters, new themes and concepts and much, much more besides. As you can see, it certainly nails the look and feel of the original trilogy. If Rare made a fourth game (or a best of collection), it would probably be a lot like this. And while a few people have criticised a couple of the new themes for not being as well integrated as others (like the desert and graveyard shown in the video), it’s still pretty impressive that anyone would go to all the effort of actually making and simplifying 3D models to use in a game like this. It’s definitely got its flaws, but Donkey Kong Country 4 is a really well thought out game that honours the original series really well. Like this one then. 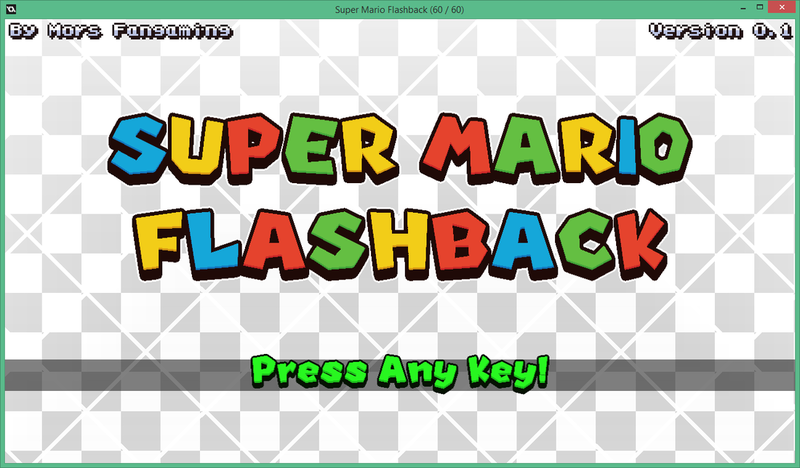 Made by MFGG user Mors, Super Mario Flashback is basically the 2D Mario platformer the GBA never got. Complete with an interesting level design concept (2D Mario levels with multiple objectives, Mario 64 style), top notch spritework and great music. What’s more impressive here is that pretty much every graphic in the game was made by the developer. As in, he sprited all the enemies, Mario himself, the backgrounds, the tilesets… and yet made something that actually looks a lot like what Nintendo might have made in the early 00s. Indeed, it actually reminds me an awful lot of Super Princess Peach in terms of the general aesthetic feel, which is incredible for a fan made game. Either way, it’s a great fan game, and one that Mario fans bored with the New Super Mario Bros style should go and check out right away. Cause hey, how much of Metroid 2 have you played? Yeah, join the club there, because Metroid 2 is seen as a somewhat difficulty game to get into. It’s got a fairly confusing world to explore without a whole lot of variety and a bunch of objectives that pretty much come down to the same idea over and over again. Either way, it’s a great project, and from the pictures and videos posted there, it looks like an absolutely incredible experience all round. And hey, the fact it’s in active development helps too, the blog was only updated with news about the revamped Metroid Queen boss earlier this month! So not only is it a great fan remake, but it looks like one we’ll actually see finished and released fairly shortly! Namely, this interesting Super Mario Bros ROM hack. Because yes, this is one of the few genuinely interesting mods of the original Super Mario Bros on NES. Why is it so interesting? And heck, much more besides. The music is being revamped and reworked. The graphics system is getting a massive overhaul with proper backgrounds and scrolling. Heck, it even seems like vertical scrolling might be making the trip over as well! That’s just crazy given how old the original game is. How basic the whole thing is. This w7n guy is literally planning to make a game that blows even Extra Mario Bros out of the water, and is all round rebuilding Super Mario Bros 1’s engine to do so. Either way, I highly advise you to read some of the updates about it on ROM Hacking.net, because damn, Mario Gaiden will be incredible when its finally done. Yeah, this was a tricky one to judge. We’ve had great fan game after great fan game here, and for the most part, most look to be almost professional quality in general. It’s hard to judge whether say, a fantastic Metroid 2 remake is a better effort that rebuilding Super Mario Bros 1’s engine or trying to port Super Mario Sunshine to the original DS. You could make good arguments for all of them. But in the end, Project Beta Triforce takes the crown. Why? Because it’s one of the biggest, most ambitious ROM hacks of The Legend of Zelda Ocarina of Time in recent memory. Remember the whole URA Zelda thing? Project Beta Triforce is basically an active replacement for that. A full scale mod with new dungeons, new areas, new game mechanics and god knows what else. And what’s also interesting is that the developers of this game plan to finally fix those Triforce rumours once and for all. In Project Beta Triforce, you will be able to get the Triforce. Not see it, not get told it’s in a few cutscenes and currently split amongst Link, Zelda and Ganondorf. Actually collect the Triforce for yourself. It’s not much now (given how later games like Skyward Sword made it possible on an official level), but it’s a nice touch for anyone who wanted it back in Ocarina of Time. Either way, Project Beta Triforce tops the list. It’s an impressive Ocarina of Time mod with a lot of cool custom content, reworked dungeons and various large world and mechanics changes as well. As a result, I think it’s a worthy project to finish off the list with. And that concludes the list. But what do you think? Are these Nintendo fan games and hacks impressive to you? Do you think we chose the right order for the list? Post your thoughts on this here in the forums and over on social media now!